Congratulations to some of the parents in the neighborhood. You made it through another summer and the kiddos are back in school. However, that also means getting getting them to their after-school practice, providing dinner, and assuring that their homework is completed, all before bedtime.. And the kids think they have it rough. The HOA is also undergoing changes. We will be replacing one KB Board of Directors member with another KB employee. We look forward to working with Gerry Poe who replaced Laurie Laura at the August Board of Directors meeting. Yes, you read correctly, the Board of Directors were finally able to meet on August 21. We also look forward to replacing another KB member with a third resident member by the end of the year, or sooner if possible. Please go to the waterleaffalls.com website for meeting minutes which will be posted after the September Board meeting and other updates. Tracy went on a ride-along with the property inspector to understand the procedure better. After review, we will be discussing the lawn violations procedure with the management company. However, unfortunately, there were still quite a few residents whose trashcans were out in front and could be seen from the street as well as BBQ grills, trailers and other unsightly things. These will continue to get violation letters and fines if the infractions are not corrected prior to inspections. Please note the schedule in the calendar to the left. Our goal is that no letters need to be sent out. If you have a concern about a violation, please contact Jim Smitherman and he will rectify, if possible. 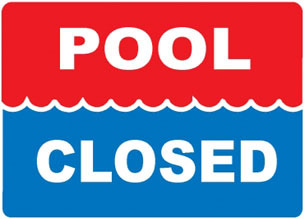 Have a wonderful Labor Day and remember the pool season ends at the end of September. The pool committee would also like to thank Larry Simone for all of his work in fixing the large tables and the side tables. Thank you! Bring your pet to get a microchip, provided by PAWS, for $15. Treats will be provided for your pets and a vendor who can provide custom personalized collars with identification will be on hand. 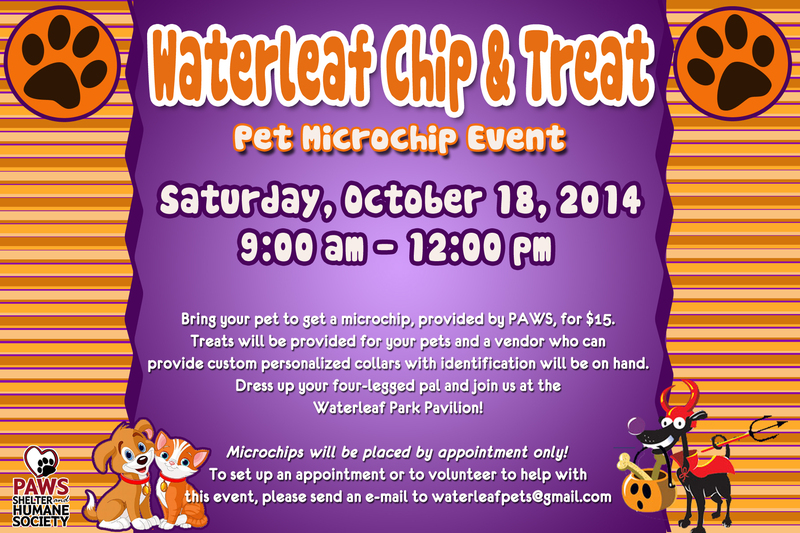 Dress up your four-legged pal and join us at the Waterleaf Park Pavilion! Every two seconds a family companion is lost. Tragically many never make it back home because they lack identification. A microchip along with a collar and identification tag is the BEST ways to ensure you and your companion will be quickly reunited. In today’s society we treat our companion animals as beloved members of the family. While we try to do everything to ensure their safety, unforeseen events like a broken fence, open window or damage resulting from a storm or earthquake, may result in our companion becoming lost. Why microchip if they already wear a collar and tag? Simply because collars can fall off or break, tags can be lost or wear off so they are illegible. A combination of a microchip, properly fitting collar and current identification tag, and keeping your companion properly confined, are the best insurance policies you can provide to keep your animal friend safe. • A microchip is a non-removable form of identification. • About the size of a grain of rice, a microchip contains a personal identification number that stays with your companion animal forever. • A microchip is inserted under the skin of your companion with an injection and it is a safe and easy procedure. • When a lost animal is found, it can be taken to a local animal shelter, veterinary office, or animal control agency and examined with a hand-held scanner that reads a code specific to your animal. • Every animal with a microchip should be registered so that the 24-hour telephone hot-line can provide the finder with information necessary to help reunite you and your companion quickly. Ask about this when adopting. Hopefully your companion will never need this protection, but microchip identification can help provide INSURANCE that you and your companion animal will be reunited after an accidental separation. The time and location for this month’s board meeting is yet to be determined. Please check back to this website for updates. Sign-up for e-mail updates to receive an update directly to your inbox as soon as it is available. KB has expressed a serious interest in the neighborhood taking over the Board completely by next year’s annual meeting. We hope to be transitioning 2 of the KB board members prior to next year’s annual meeting. These 2 members will be up for election as well as the final member at the 2015 annual Meeting. As was the 2 resident board members elected at the 2014 annual meeting, the terms will be 3 year terms. Responsibilities will include attendance of monthly Board of Director Meetings, interaction with the property manager as needed, and architectural approvals. If interested, please contact Jim Smitherman by phone at 512/502-2114 or via e-mail at jim.smitherman@goodwintx.com for a nomination form. Join us as we deliver Welcome Packets to our new neighbors! This is a great way to volunteer in your community and meet new people. Our next meeting will be on October 5, 2014 at 6:30 pm in the Waterleaf Park Pavilion. All of our committees along with committee chairs and contact e-mails are listed on the front page of the newsletter. Simply e-mail the chairs or attend a meeting if you would like to get more involved. You can also submit a web contact form. October’s Yard of the Month will be for the best Halloween decorations, so let’s see what you ghouls and goblins can create! ← Reminder: August Board Meeting Today!